Marketing,Sales Promotion, Design & Development, Information Technology, Administration.
" Today's businesses need partners who can talk about strategy and technology in the same conversation. 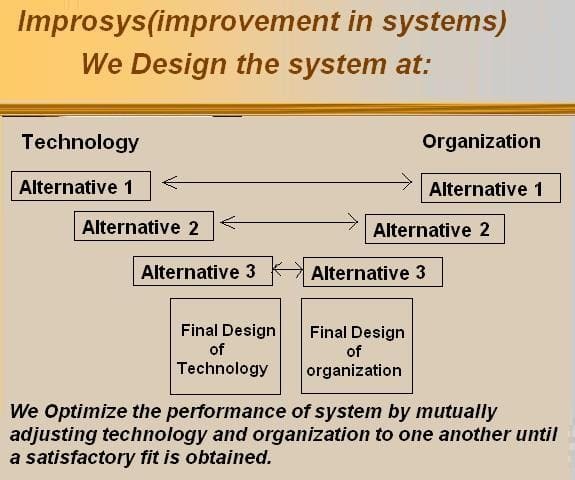 At Improsys, we believe true value from technology requires an in-depth understanding of business strategy. Our cross-industry consulting services help you craft a vision for your organization and then provide a specific, practical business and technology framework that will make that vision a reality. Our consulting competencies spread across business, process, quality and technology consulting." Maintaining the Present Rapid Growth Rate. There are not enough Orders. Decrease in utilization of machines. Decrease in performance of employees. Decrease in level of quality standards in all functional areas. In the present market conditions company is not competitive enough. CompanyÃ¯Â¿Â½s resources like Men, Material, Machines & Money are not utilized properly. 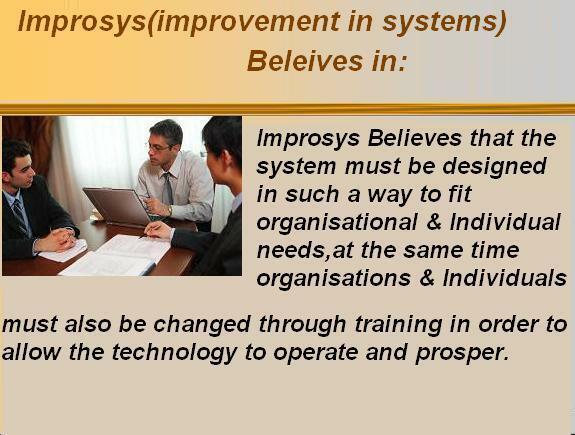 Yes, there is need of organizational and management solution provider called- "Improsys". Our expertise is in converting business models to effective long-lasting business software solutions. Business processes are the keys that results an organization. The performance of the organization depends on how these business processes are designed and managed. The key is continuously transform and align IT and business processes to changing strategic and tactical needs. We leverage our in-depth understanding of business processes and technologies to provide integrated outstanding solutions as part of our Business Process Services. Our solutions not only seek to reduce the total cost of ownership for our clients, but also aimed at improving Productivity, Quality, Cashflow, on time delivery and value. We understand the factors influencing businesses, their markets and diverse needs. This helps us assist our customers by identifying the right solution and implement it in the best possible way. We utilize our technical skills and business acumen to bring the best business solutions to our customers. Our solutions are supported by a series of technology enablers such as Document Management System (DMS), workflow solutions, dashboards and Electronic Data Exchange (EDE). Business Process Management for Marketing. Business Process Management for Manufacturing. Business Process Management for Finance. Business Process for Human Resource Management. Business Process for Inventory/Warehouse Management. Business Process for Projects Management . Business Process Management for Engineering. Business Process Management for Design. Improsys offers Business plans and Business Solutions with the goal to optimize business decisions and providing relevant, up-to-date information to business users.